Peradventure, you bought a second-hand iPhone or iPad, and you can’t finish the setup process because it asked for the previous Apple ID and password. You are a sticky condition. You won’t be able to use the device unless you go to the seller and ask them for the password. What’s Exactly an Apple ID? Apple ID refers to the account an iOS device owner utilizes to enjoy the Apple services. The ID is needed for almost everything. It is needed to shop on iTunes, buy applications in the App Store and even sign into iCloud. If you do not have the password for the Apple ID on your iOS device, it is impossible to enjoy the services offered by Apple to its device users. The best solution for when you are stuck with an Apple ID whose password you do not know on your iOS device is iMyFone LockWiper. LockWiper lets you remove the Apple ID without a password irrespective of whether the device’s Find My iPhone feature is on or off. LockWiper is capable of removing the Apple ID on all iOS devices. You can use it on your iPhone/iPad/iPod Touch. 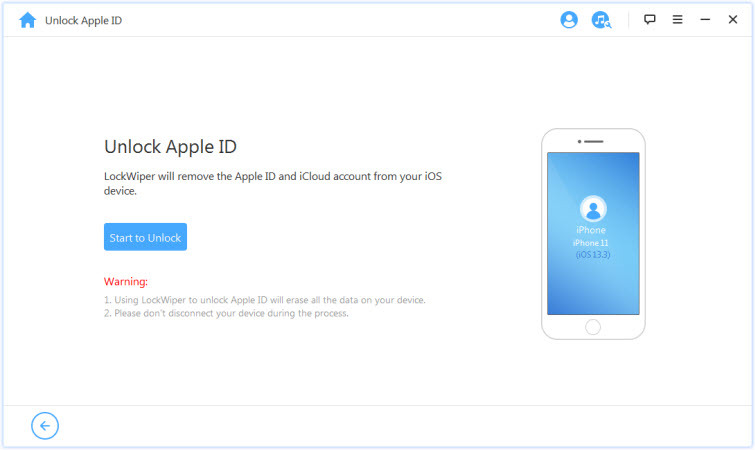 Remove Apple ID and iCloud account from activated iPhone/iPad without any password. After Apple ID removal, you can switch to a different iCloud account or create a new one. It works for any activated iPhone even when Find My iPhone is enabled. It doesn’t require any answers for the security question of the previous account. The removal will be easily done by yourself at home, and it doesn’t need your IMEI code. Step 1: After installing iMyFone LockWiper on your computer, launch it. 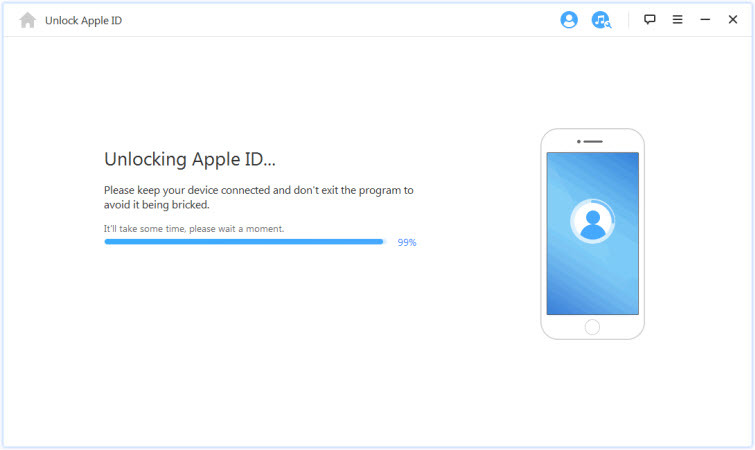 Connect the device whose Apple ID you wish to remove to the computer and trust the connection. Step 2: Select the Unlock Apple ID mode on LockWiper and then tap the Start to Unlock button. Step 3: LockWiper will start removing the Apple ID if “Find My iPhone” is disabled. If the Find My iPhone feature is enabled, follow the onscreen instructions to reset all settings on the device. When your iPhone reboots, it will starting the removal process. That’s it, you just need to wait for a moment for it to complete. You can enter your iPhone to recovery mode to reset it when Find My iPhone is turned off. Step 1: Make sure you have the latest version of iTunes. Connect your iPhone to the computer. Step 2: While connection, force restart your iPhone by pressing and holding the Home and Sleep/Wake buttons at the same time until you see the iTunes icon on iPhone. Step 3: When you enter the recovery mode, you will see a message with option to Restore or Update on iTunes. Wait patiently until it finishes. Your iPhone will be reset and the Apple ID will be removed. Before discussing how to do an Apple password reset without Apple ID, let us quickly examine how to change Apple ID password in the standard way using your Apple ID password. Just follow the steps below. Step 1: Sign in to your Apple account on appleid.apple.com page. Step 3: You will need to input your current Apple ID password then you will input your new password and confirm it. Step 5: You can now use the new Apple ID password for all transactions. In the previous steps you learned how to change your password using the Apple ID password, now I will show you how to do an Apple ID reset peradventure you have forgotten the Apple ID itself. Just follow the steps below. Step 1: On your iPhone or iPad, go to Settings > iCloud. Step 2: Tap the email address at the top. Step 3: Click on the Forgot Apple ID or Password. Step 4: Enter your Apple ID. Step 5: Answer the security questions that you set up before. Then you can reset the Apple ID password. Step 6: Enter your new password and confirm it. After resetting Apple ID password, I recommend that you set up a “two-factor authentication” or “two-step verification “process for your Apple account. These are very reliable and can still get through even if you forget your Apple ID or password. Being stuck with an iOS device that has an Apple ID whose password you don’t know has a lot of limitations. For example, you will not have the ability to switch a different account on the device or even have full control over the iOS device. By removing the Apple ID, you will eliminate the possibility of the original owner of the iOS device tracking your iDevice account or blocking your iPhone usage remotely. iMyFone LockWiper makes removing an Apple ID without a password extremely easy. The tool allows you to use its free trial version. You confirm whether it works before paying for it.